1. Comparing independently developed AVM Values to County Market Values will point to the areas of failure - over- and under-assessment - on the Roll. Often, the higher value properties are under-assessed while the lower value properties are over-assessed. If the comparison points in that direction, the Property Tax Appeals Consultants ("Consultants") must work up a small sample - using comps - to further authenticate the discovery. If the comps sample validates the discovery, Consultants must pay special attention to that over-assessed segment of the population. FYI - many such Consultants use our free Homequant site to work up samples. Our site, unlike other free valuation sites, allows users to arrive at their own value conclusions. Homequant is a true valuation site with advanced features like specific comps selection and adjustment mechanism, distance matrix, time adjustment, flexible valuation date, multiple ranking methods, interactive spatial interface, comps grid, value analysis, to name a few. In addition, no log-in or registration is ever required. 2. In choosing AVM Vendors, Consultants must make sure that those AVM Values are developed specifically for the Tax Status Date. If the Status Date is 01-01-2015 but the AVM Values were developed in June 2014, those values would produce a flawed picture when compared to the County Values. It is therefore advisable to work with AVM Vendors that develop specialized models for the Appeals industry, per se. It is also in the best interest of the Appeals Consultants to work with such vendors. 3. Many AVM Vendors also sell Comps Reports. However, the best bet for the Appeals Consultants is to work with those specialized AVM Vendors that additionally tie their AVMs to the Comps production. In other words, the specialized AVM Vendors who connect model coefficients and adjustments to the comps Adjustment Matrix tend to produce the most optimal values. If a Consultant is looking for a long-term vendor, this is a question always worth asking. 4. In course of the due diligence Consultants may ask for a sample Adjustment Matrix for the comps production. The sample itself could say a lot about the quality of their valuation process. For example, if the Adjustment Matrix shows Lot SF coefficient of .10 (10 cents per Lot SF, assuming it's transferred from a linear regression-based AVM model), just dump them and move on (Hint: it's not multi-collinearity). It would be a clear indication that they are working with totally unqualified "make-shift" modelers. 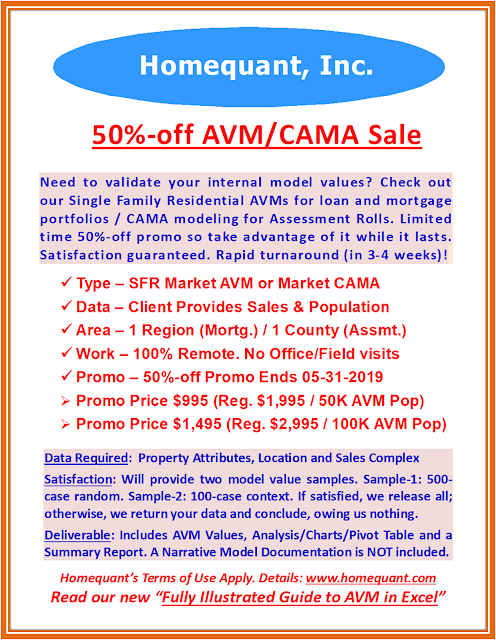 While no AVM Vendor would be forthcoming to show their AVM models, they might share a sample Adjustment Matrix. It could be telling! FYI - To learn more about AVM, you may request complimentary copies of our trend-setting books on AVM: How to Build a Better AVM and Alternate Applications of AVM. How would Homeowners relate to over and under assessment, spatially. Town Analyst Guides. As indicated in prior Blog posts, since the body of the Countywide Sales Ratio curve (meaning between the 25th and 75th Percentile) points to a ratio around .87, all Towns in this County must be valued close to this ratio so that the Assessment Roll becomes fair and equitable. Obviously, sales must be individually validated and the outliers removed from the sales universe. Better yet, those sales should then be modeled and the resulting model-defined outliers removed as well, thus paving the way for a more scientific universe of ratio-eligible sales. This analysis is extracted from Homequant's "Town Analyst" portal. Although this analysis is currently live for one County only (Seminole, FL - on our homepage), we will soon introduce it for all of the markets we cover. Meanwhile, please visit the Town Analyst site. It's completely free and requires no registration whatsoever. How would Homeowners know if their Town is Fairly-assessed. Town Analyst Elucidates. Sales Ratio (County Market Value to Adjusted Sales) is a better indicator of the proper assessment level than the Assessment Ratio (County Assessed Value to Adjusted Sales), as the latter often includes Town-wise special assessments, abatements, exemptions, etc. All sales therefore must be adjusted to the taxable status date (in this case 01-01-2015) so the two values are comparable and the resulting ratios are statistically significant. In this example, since the Countywide Median Sales Ratio is .87, all Towns in that County must be valued close to this ratio so that the Assessment Roll becomes fair and equitable. Better yet, compare the 25th to 75th percentile of the ratio curve. If the sales are individually validated for ratio eligibility (ours are not), a much wider range – say, 5th to 95th - could be considered. This Town shows not only a perfect Median Ratio of .87, but the 25th and 75th are in line as well, making it a fairly-assessed Town in that County. In fact, save the aforesaid two slightly over and under-assessed Towns, this County has done an excellent job in producing a fair and equitable tax roll. While this is the Town-wise summary of ratios, in a separate Blog post we will further drill down to the areas in the Town - spatially - where the incidence of over/under-assessment could be more severe than their counterparts. This analysis is extracted from Homequant's "Town Analyst" portal. Although this analysis is currently live for one county only (Seminole, FL - on our homepage), we will incorporate them for all of the markets we cover, perhaps within a month. Disclaimer: This analysis is strictly illustrative. Any commercial or legal use of it is totally forbidden. Always consult a Tax Attorney on statutory requirements. How would Homeowners know if their Town is Under-assessed. Town Analyst Demonstrates. This Town however shows a Median Ratio of .82, while the 25th and 75th are .85 and .80, respectively, making it a somewhat (nothing major, though) under-assessed Town in that County. While this is the Town-wise summary of ratios, in a separate Blog post we will further drill down to the areas in the Town - spatially - where the incidence of under-assessment could be more severe than their counterparts. How would Homeowners know if their Town is Over-assessed. Town Analyst Explains. This Town however shows 2 to 3 points higher Sales Ratios across the 25th-to75th percentile curve, making it a somewhat over-assessed - nothing major, though - Town in that County. While this is the Town-wise summary of ratios, in a separate Blog post we will further drill down to the areas in the Town - spatially - where the incidence of over-assessment could be more severe than their counterparts.